Inkcontinuous.com offers brand new inkjet cartridges to replace the OEM Epson T273 inkjet cartridges, that are exclusively designed to deliver photographic-quality prints and laser-sharp text. Our inkjet cartridges are engineered with the latest fade-resistant technology to last longer and are capable of drying instantly for smudge resistant prints, every time. 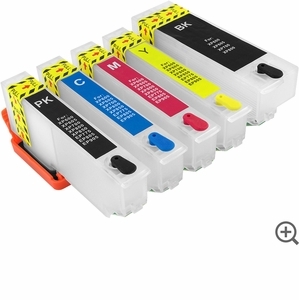 The prefilled ink cartridges can be used as regular ink cartridges for an easy using. This cartridge can be easily refilled and reused again and again. There are easy-refill hole and rubber plug on the top of each cartridge, which is very easy to remove the plug for ink refill and replace it back after refilled for the easy refilling. The cartridge is transparent. It is easy to view how much ink left to prevent from lack of ink to cause air bubbles or how much ink filled in to avoid overfill for easy operation. These patented cartridges are environmental friendly, 3R (recycle, reuse, reduce) green products for endless inkjet printing with big saving. * T273XL Black Inkjet Cartridge not compatible with: XP-850, EP-775, EP-805 and EP-905. This is not an OEM product.